Originally C13, the chancel was altered in the C14. In the C15 a tower was added and the nave altered, with a new roof. The chancel and north aisle date from 1879. When first built, probably in the C13, Crawley parish church was a chapelry of Slaugham (Hussey p218). The nave south wall is of this date, though heightened later. It is built of rubble with a plain pointed doorway, now blocked. A two-light C14 south window is the earliest feature of the chancel (1 p6), though it is likely to date from the C13, like the nave. The Sharpe Collection drawing (1805) shows a rood-stair turret at the south east angle of the nave, which probably dated from this time, as it had a trefoil-headed lancet, now reset in the C19 vestry. In his will of 1466/67, Richard Jay states that ‘if the werk of the steple of the chapel at Crawleye be not fully perfourmed up in my life, that thanne it be perfourmed up fully by mine executours’ (SRS 42 p47). 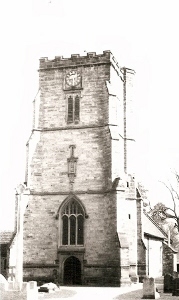 This not only dates the tower, but shows that Crawley was then still a chapelry. The tower seems typically mid-C15, with heavy diagonal buttresses, a doorway with traceried spandrels, a west window with panelled tracery and long square-headed bell-openings. The stair-turret changes from square to octagonal with grotesque heads in the angles, like those on the corbel-table under the battlements. However, the C14-style north and south windows are not on the Sharpe drawing, though the hoodmoulds look old, and also inconsistent are the upside-down moulding on the base and the top six courses and battlements in a different stone. An inscription concealed under the clock, stating that the tower was rebuilt in 1807, provides the probable answer. It cannot be taken literally, for much of the structure is demonstrably old, including the unusually low tower arch, which has more complex mouldings on its west side. Horsfield, a near contemporary source, states the tower was ‘repaired’ in 1804 (I p264), which is near enough to 1807. This work probably included the side-windows and the increased height. However, the obviously reset crudely carved figures over the west window were had been placed there at a previous date, for Horsfield quotes a C18 reference to them in this position. Their date has been much debated, but though different in size, they are clearly related and may be regarded as substantially late mediaeval, probably of much the same date as the tower, though their original purpose is obscure. The nave was remodelled about the time that the tower was built. Obviously C15 is the nave roof, which has Horsham slabs and, inside, prominent wind-braces, complex moulded tiebeams and small traceried niches on alternate wallposts. The easternmost tiebeam is inscribed: ‘Man yu wele be war, for War[l]dly good makyth man blynde; be war be for whate comyth be hind’. As part of this work, the walls were heightened in ashlar, but the interior remains low and must have seemed more so when there was no north aisle. The square- or depressed-headed south nave windows, though renewed, look mid-C15, but an uncusped one may be C16. The C14 chancel was shortened soon after the Burrell Collection drawing, which shows a timbered east gable above a C15 or C16 two-light uncusped square-headed window. Possibly the reset windows in the tower came from it, for Quartermain ((E) p67) shows a plain east window with Y-tracery. In 1827-28 J Snelling added a west gallery (ICBS) and this appears to have been altered in 1844, when there were further repairs, for which H Ockenden (ibid) signed the ICBS completion certificate. Ockenden also exposed the nave roof. This work probably accounts for most of the £790 10s spent on restoration work by 1875 (PP125). None of it survived H Woodyer‘s restoration in 1879-80 (B 37 p1037), which cost around £3000 (KD 1899). He added a north aisle and seven-bay arcade. Its grouped lancets have rere-arches with free-standing shafts. Woodyer rebuilt the chancel to its original dimensions, 17 ft longer than it had been immediately before (Elliott and Pritchard p238), and replaced the chancel arch. He did not solve all structural problems, for by 1911 the chancel roof was slipping and had to be repaired by G F H Banks (CDG 209 (May 1911) p91). Hannah (1 p10) wrongly attributes the whole chancel, aisle and vestries to him. Brass: (In front of chancel steps) Anonymous and small effigy of a woman, c1520, who may be Joan Culpeper (Mosse p62). Font: A bowl of marble, with corners cut away to create an irregular octagon. Until recently it was assumed to be C15; though A K Walker includes it, she comments (p104) that it is later than most of interest to her. The most recent interpretation is that it is a square late C12 font, with the corners removed subsequently (www.crsbi.ac.uk retrieved on 1/4/2013). 1. (Light over porch) St Nicholas. J Hardman and Co, 1863 (Elliott and Pritchard p261) . 2. (Unspecified 3-light window) Eight Beatitudes, J Hardman and Co, 1863? (ibid). 3. (Aisle) 13 windows by J Davies of Done and Davies of Shrewsbury, 1880 (B 39 p572). The choice of this company was probably because the rector at the time of the restoration, the Rev J B Lennard (see below) had previously been a vicar in Shropshire. 4. (East window and other chancel windows) Also by Done and Davies, 1880 (ibid). 5. (South, second window) A E Child, 1906 (www.stainedglassrecords.org retrieved on 11/2/2013). Monument: John Broadwood (d1812), the founder of the piano-makers of that name – see under Rusper for more evidence of the family’s interest in churches in this area. Signed by Patent Works, Esher Street, Westminster. Pulpit: Formerly dated 1627, on a later stone base. The sides are carved in low relief. The challenging instruction ‘ Be brief’ carved on it was the work of J B Lennard (see below) (Mee p109). Rails: Late C17 with twisted balusters. Reredos, stalls etc: The oak reredos was carved in 1882 by the rector, J B Lennard (CDK 1883 pt2 p161), in a robust style, using wood taken from the belfry at the restoration. He also carved the choir stalls in 1885-86 (ibid 1887 pt2 p144) and is stated to have made the reading desk (Mee ibid). He may be presumed to have made other fittings as well. Stoup: (By west doorway) Broken, but it confirms the tower is mainly C15.